Next June 3, the world will commemorate the 50th anniversary of the passing of a remarkable man: Angelo Giuseppe Roncalli, better known as Pope John XXIII. It is a shame the Israeli public is not well aware of him, as he was one of the greatest friends of the Jewish people. Back in the 1940s, as the apostolic delegate of the Vatican in Istanbul, Cardinal Roncalli spared no efforts to save as many Jews as possible from the Nazi extermination. He went out of his way to help the beleaguered Jews. Among his deeds was the dispatching of “certificates of immigration” to Palestine via the Vatican’s diplomatic courier. He also overtly intervened in favor of Slovakian and Bulgarian Jews. Had he only done this, we would say “dayenu,” enough. In February 2011, the International Raoul Wallenberg Foundation, a global-reach NGO I had the honor to found, together with the late US Congressman Tom Lantos, submitted to Yad Vashem a voluminous dossier with evidences of Roncalli’s life-saving feats during the Shoah and with our strong recommendation to have him recognized as Righteous among the Nations. Our request is still pending. After the war, as papal nuncio in Paris, Cardinal Roncalli made another great contribution to the Jewish people. This was revealed to me independently by the late Moshe Tov, one of the founders of Israel’s diplomacy and much later by Yair Zaban, who needs no introduction. As a young man, Zaban was the personal secretary of Dr. Moshe Sneh, a prominent leader of the Jewish Yishuv who in 1947 held the senior post of head of the political department of the Jewish Agency in Europe. It was Sneh who confided to Zaban the kind of help he got from Roncalli. Sneh’s boss, Moshe Shertok (Sharett) was worried about the voting of the Latin American countries in the upcoming UN General Assembly that was about to address the partition plan. He was concerned about the influence of the Vatican on those countries, fearing that the Holy See would guide them to vote against the plan. Shertok called Dr. Sneh and instructed him to persuade the Vatican not to object the voting preferences of the Latin American countries in which the Vatican wielded a considerable influence. Eventually, through a good friend, the Jewish priest Alex Glasberg (who in 2004 was recognized as Righteous among the Nations for his rescue actions during the Shoah) put Sneh in touch with Monsignor Roncalli, who in turn arranged for the Jewish leader an audience with the then-secretary of state of the Vatican Cardinal Domenico Tardini. The meeting took place on October 3, 1947, and it turned out that Dr. Sneh was successful. His role as Pope John XXIII is better known. On April 29, I will be in Jerusalem to participate at the “International Conference – Honoring the memory of Pope John XXIII, the Shoah, the Jews and the State of Israel,” where I will chair the panel which will deal with “Roncalli and the Establishment of the State of Israel.” This fills me with emotion. A few weeks ago, I learned that the Municipality of Ashdod has accepted the Wallenberg Foundation’s proposal to name a street of this important city after Angelo Roncalli. Perhaps Roncalli is starting to get recognition. Later this year, together with the chairman of the Wallenberg Foundation, Eduardo Eurnekian, we shall fly to Bergamo, Italy to award a specially-coined medal to Monsignor Loris Capovilla, aged 97. Capovilla was the personal secretary of Pope John XXIII and has devoted his whole life to keeping alive the legacy of his beloved boss. I am also very moved following the election of my fellow countryman, the Argentinean Jorge Mario Bergoglio, as the Supreme Pontiff. Pope Francis is one of the first members of the International Raoul Wallenberg Foundation. I know him personally. He is a humble man with a great heart. 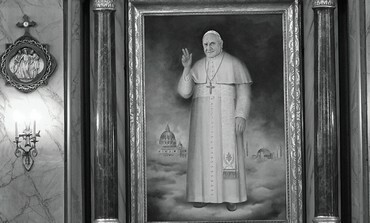 As successor of the late Cardinal Antonio Quarracino, he became the custodian of the Commemorative Mural emplaced at the Buenos Aires Cathedral, in memory of the victims of the Shoah and of the two terrorist attacks perpetrated in the Argentinean capital, in the ‘90s, against the Israeli Embassy and the AMIA Jewish community center. This monument is unprecedented. In fact, it is the only Jewish memorial in a Catholic Cathedral. Often I ask myself why this mural does not get the attention it really deserves. It has a strong symbolism and relevance, underscored by the victims of the Holocaust, the victims of the AMIA bombing (a tragedy which has resurfaced following the scandal generated by the Memorandum of Understanding between Argentina and Iran), and all this amplified by the fact that the guardian of the mural is an Argentinean who became pope. I have a sense of comforting deja vu. A strong feeling that Pope Francis will follow the path set by Blessed Pope John XXIII. Both men share the same humility and the same love and respect for human beings, regardless of their background or religious belief. The foundation I lead, together with our chairman, Eduardo Eurnekian, is not Jewish, but personally, as a Jew, I feel the necessity of being grateful, of recognizing goodness (hakarat hatov), which is one of the pillars of Judaism. Therefore, we should cherish the blessed memory of Raoul Wallenberg, Angelo Roncalli and all those who stood-up against evil and made a difference. *The writer is the founder of the International Raoul Wallenberg Foundation, a global-reach NGO whose mission is to preserve and divulge the legacy of Raoul Wallenberg and other rescuers.